Cisco engaged Miercom to evaluate the performance of the newly launched ASA 5500-X Series of Adaptive Security Appliances against comparable products selected on the basis of intended markets and MSRP. Three different comparative scenarios were tested. Products from Check Point and Fortinet were included in the testing and compared to similar offerings from the ASA 5500-X series. 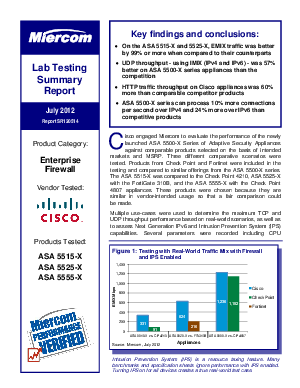 The ASA 5515-X was compared to the Check Point 4210, ASA 5525-X with the FortiGate 310B, and the ASA 5555-X with the Check Point 4807 appliances. These products were chosen because they are similar in vendor-intended usage so that a fair comparison could be made. To learn more about this summary report. Download today, compliments of Cisco.